On today's 360°, we explore a rather unusual family home that effortlessly marries the old with the new, modernity with traditional elements. There's something for everyone when it comes to modern design, but it is particularly well matched with Japanese architecture as it follows the same principle of form following function, as well as an abiding love affair with clean design. More is expressed through simplicity than through unnecessary details. 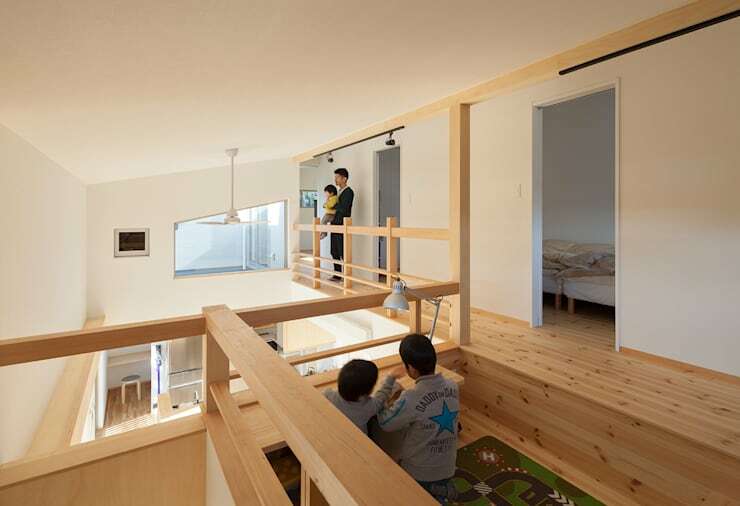 Today's home has been designed by the Fukuoka-based Misumia who have moulded this small home around the very specific needs of the family that owns it. It has been customised to be the perfect home for growing up for the two kids of the family as well as a serene sanctuary for the parents. One of the biggest advantages of the house was the surroundings it came with. Located in a naturally green environment with mountain views all around, the house is also sufficiently set apart from its neighbours, making for unobstructed views. The facade plays with volumes, by annexing the unusually-shaped black structure. The slanted roof not only makes for an interesting visual element, but also directly and positively affects the interior volume of the house. Not to forget, it helps shed rain and snow. With such spectacular surroundings, not much had to done with regard to the garden, but in keeping with the colour scheme of the facade (as well as utilitarian purposes such as the garage), one side is a stone pathway while the other—the entrance—has a lawn. As soon as you enter the home, a sense of spaciousness welcomes you to the atrium. With a combined kitchen/living/dining area, this is the heart of the home where family members gather to cook a meal or partake in it. The south-facing windows ensure that this central area is flooded with light during the day, giving it a bright and comfortable vibe. 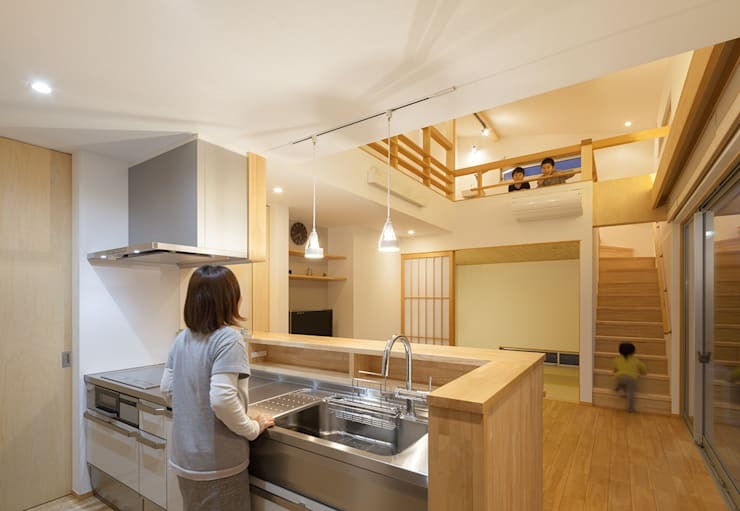 This is further aided by the extensive use of timber in the interiors— a characteristic trait of Japanese design. Traditional elements like rice paper blinds (that can be drawn to ensure privacy) co-exist harmoniously with modern features such as the unusually-cut window that mirrors the facade. The second floor of the home has a bunch of interesting architectural features. Let's talk about that cleverly-designed children's spot first—this is where the children can do their homework as well as engage in a bit of fun and games. It also looks straight out onto the atrium allowing the parents to keep a watchful eye on them. The bedrooms are lined up along the long, narrow corridor that almost acts as a lookout point! Notice how the transition between the upper and ground floor is kept seamless—this was achieved by avoiding any bulky partition walls or staircases that would visually crop up the space. Here's where Mama bear can keep an eye on her children while pottering around in the kitchen! The kitchen itself is enclosed within a timber pony wall (that provides plenty of storage; refer to picture 1) that subtly separates it from the living areas, and is almost entirely done up in stainless steel giving it a sleek, contemporary look. If modern kitchens are your style, speak to our experts who can help you recreate the style in your home. On the far end of the room, adjacent to the staircase, you can also see a traditional tatami room that serves as an extension of the living room where guests can be entertained. 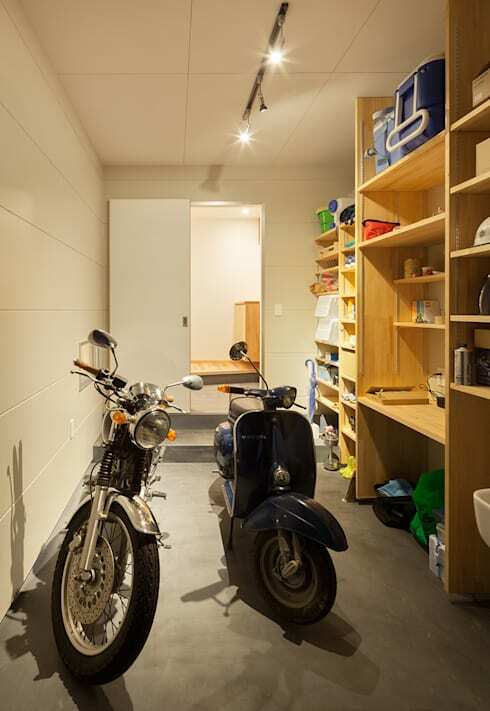 Apart from housing a bike and a scooter, the garage of this home also doubles up as a storage space as the family wanted to avoid clutter of any sort in the main wing. Garages are often the most under-utilised spaces in a home, reserved solely for dumping never-to-be-used-again stuff. But with good planning, they can turn into organised spaces that take care of your storage needs. The floor-to-ceiling open shelves here whose height can be adjusted act as flexible storage space where things are organised according to their use. Multi-functional areas? You're looking at one. 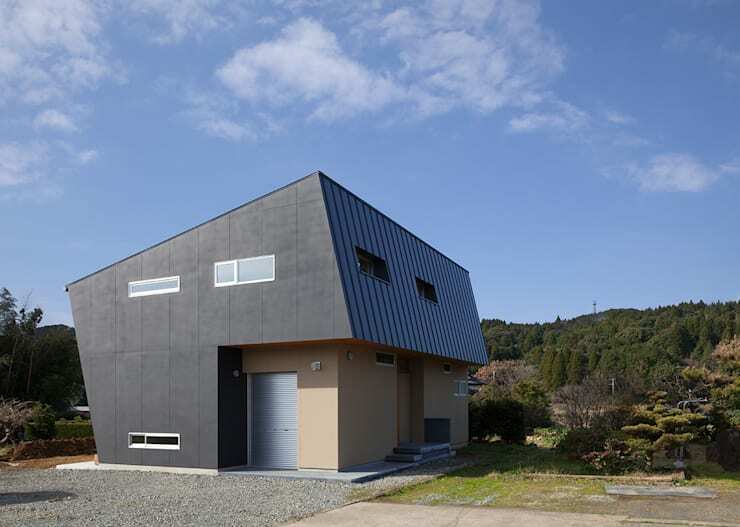 To see another gorgeous Japanese home surrounded by natural beauty, check out A surprisingly spacious family home. What did you think of this understated yet cheerful home?